Now that both Avengers: Infinity War and Ant-Man and the Wasp have been unleashed unto our universe, it's time to look forward to what's coming next: Captain Marvel. The film doesn't hit theaters until March, but now that the first few trailers have finally dropped there's a lot to go over, especially when you take into account what happens after the Infinity War credits roll. Yes, of course there's a postcredits scene after Avengers: Infinity War. Don't be a fool! As a refresher, the moment in question shows poor Maria Hill and Nick Fury evaporating into dust . . . but not before the latter sends out a distress signal with what looks like a '90s beeper. The signal (thankfully) goes through, revealing a mysterious insignia that the average and casual Marvel fan may not recognize. It's the symbol of Captain Marvel, and she may be the key to destroying the almighty Thanos and saving the entire universe. The Captain Marvel movie is set to come out just handful of weeks before Avengers: Endgame. This seems to be a pretty sure sign that Captain Marvel's story will heavily factor into Avengers: : Endgame. So what's the deal with this mysterious hero? Well, the Captain Marvel namesake is basically meant to be the Superman of the Marvel universe. But this is where is gets a bit complicated. Now, Brie Larson is playing the titular Captain Marvel, whose alter ego is Carol Danvers. 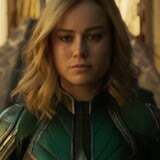 "Her origins are very much Earthbound," Marvel President Kevin Feige said of the movie iteration, "but her adventures and power base come from the cosmic realm." According to Marvel's official bio, her powers include flight, enhanced strength, durability, and the ability to shoot concussive energy bursts. Doesn't sound like much when you think about Thanos's universe-destroying powers. But that's because we have to factor in a different Captain Marvel from the comic books. The original Captain Marvel, which is a mispronunciation of the alien name Mar-Vell, is the first iteration of the hero. He's actually from the Kree empire in the far reaches of space, and he's basically the Marvel comics version of Superman. According to his official Marvel page, he can "metabolize solar energy and convert it for a variety of uses, including superhuman strength, the projection of photon energy blasts, and flight . . . Mar-Vell also possessed Cosmic Awareness, which could increase his intellect, granting him limited precognitive powers and the ability to ascertain an opponent's weakness. At one point, he also possessed the ability to teleport and cast illusions." Now that sounds like someone who could seriously interfere with Thanos's plan, right? But don't take my word for it. This Captain Marvel actually does fight Thanos in the comic books. Basically, through a series of events and the use of his Cosmic Awareness, Captain Marvel figures out a way to restore reality to a time before Thanos has gained control of the universe, which would absolutely factor in with the way things are playing out in the cinematic universe. What's more, this Mar-Vell character crosses paths with Carol Danvers at an Air Force base . . . which we see plenty of in the first trailer. And we know Mar-Vell will show up in Captain Marvel because Jude Law has been cast to play him! Mar-Vell has a human alter ego known as Doctor Walter Lawson, and according to the casting description, he'll "be a mentor-like figure as [Carol Danvers] comes into her powers." So, it seems pretty well laid-out, right? In Captain Marvel, we'll meet Mar-Vell and Carol Danvers and see how the latter party becomes the hero we know she's meant to be. Perhaps, under the tutelage of Doctor Walter Lawson, she'll even be able to acquire some of the more jaw-dropping powers that Mar-Vell seems to yield. Or, like the new 2017 comic series with both heroes, Captain Marvel and Mar-Vell will join forces to become one seriously badass duo. With these cosmic powers in the mix, combined with all the Avengers who are still alive, Thanos doesn't stand a chance.